One of our most popular tours! Sea to Summit’s Columbia Gorge Waterfalls Tour takes you along the Historic Columbia River Gorge Highway, built in 1912-1914. 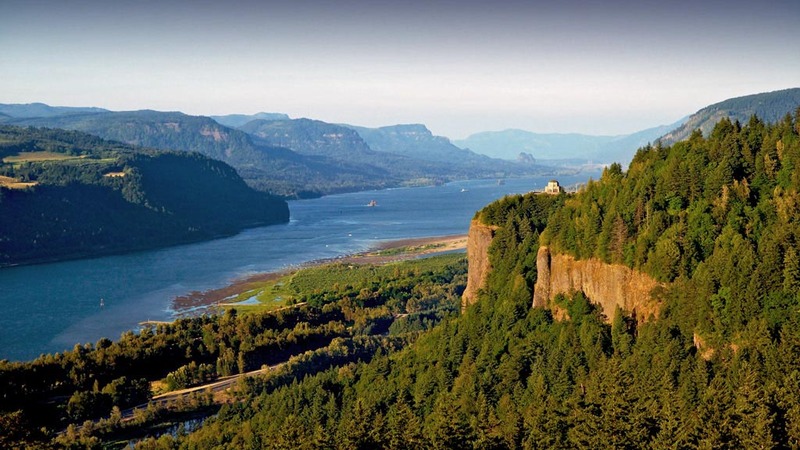 Visit scenic Chanticleer viewpoint, Crown Point, and the Vista House, all featuring with incredible views of the Columbia River Gorge. Your local guide will share the history and unique geographical features that created and surround this designated National Scenic Area. Tour and explore numerous waterfalls such as Latourell Falls, Bridal Veil Falls, Wahkeena Falls, Horsetail Falls, and the breathtaking 620ft Multnomah Falls. Sea to Summit’s magnificent Columbia River Gorge Tours are not complete without a visit to the Bonneville Dam, Columbia River Salmon Ladders, Oregon’s largest fish hatchery and Sturgeon Research Center. Our Columbia River Gorge Tours are historically and geographically informative and amazingly scenic! Make sure to bring a camera on this incredible, short but sweet 1/2 day Sea to Summit tour! The Columbia River Gorge consists of over 290,000 acres and is designated as a National Scenic Area. Up to 4,000 feet deep, the Gorge is over 80 miles long, cutting through the mighty Cascade Range and forms the boundary between Washington and Oregon. The Gorge began roughly 17 to 12 million years ago, and developed over a period of approximately 10 million years. It was during this time that the Cascades rose. The Columbia slowly eroded the new mountain range and managed to maintain its course. The Columbia Gorge had the most dramatic help when the Missoula Floods raged through in the last ice age, cutting the steep cliffs visible today. The flood waters are believed to have been up to 2000 feet deep and flowed a estimated 80 miles a hour. The floods were also responsible for the many layers of exposed volcanic rock and the waterfalls themselves.